Preheat oven to 400°F. In a medium bowl, mix together Gorgonzola, breadcrumbs, basil and peppercorns, and set aside. Add 1/4 tsp. of sea salt if desired. In a large skillet sprayed with nonstick cooking spray over medium high heat, sear steaks for 2 to 3 minutes on each side. Remove steaks from skillet and spread Gorgonzola mixture evenly on top, pressing down lightly. Place steaks on baking sheet and bake for 6 to 8 minutes for medium rare until internal temperature reaches 145°F; bake for 8 to 10 minutes for medium until internal temperature reaches 160°F; or until cooked to desired doneness. Meanwhile, in the same skillet over medium heat, stir in 1/4 cup of water. Add Pasta Sauce and cook for 4 to 5 minutes, or until heated through, stirring occasionally. 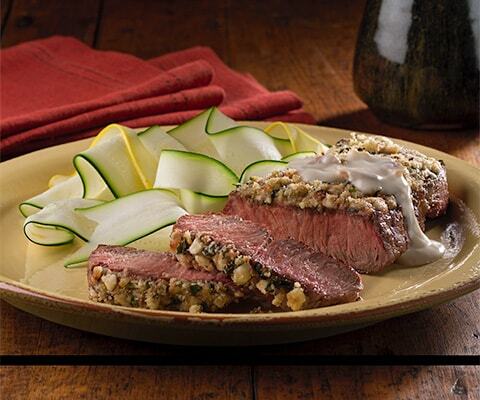 Serve hot over Gorgonzola crusted steaks.